We had been watching the weather reports with a degree of trepidation. The fine weather of the preceding week had faded and the Met Office warnings of heavy rain and winds came true 24 hours before the event. I had set my alarm to be up early and as I came to terms with the early hour I could hear the droplets lashing hard onto my conservatory roof. Just as I was about to depart the 'phone rang and I half expected it to be the organisers calling it off, but instead it was one of our exhibitors making his excuses on account of the monsoon. 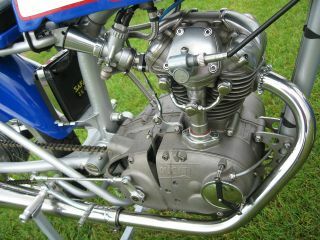 I could not blame him, but since our display had been paid for there was no alternative but to make the best of it. I set off to splash my way down to Dorset half expecting nobody else to be at the Castle. I arrived to find half a dozen eager beavers already on our stand, putting up the gazebo and parking their cars. 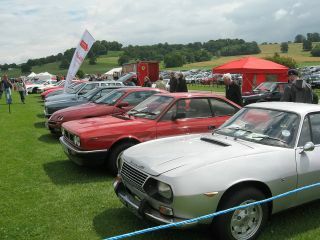 Plucky Brits that we are, we soon had twelve of the promised fourteen exhibits in position plus a new member who joined on the day and brought his Fiat Strada onto our display. Fortunately the rain and wind abated and the event gathered pace as more vehicles and people arrived to populate the castle grounds with their displays. It rained briefly only a couple of times but not too badly and it certainly did not dampen anyone's spirits. 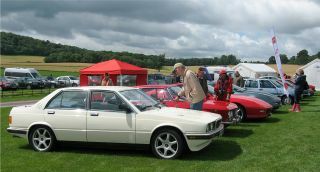 Congratulations must go to David Roots, who had donned his foul-weather gear and driven his open top Alfa Giulia Special from his home near Frome despite the prevailing conditions. 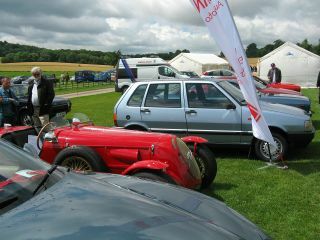 His car formed the centrepiece of our display and it certainly drew a lot of spectator interest. No sooner had we set into 'grin and bear it' mode than the hitherto delinquent weather made amends and presented an acceptably good day with prolonged bright spells. As the day progressed we had time to visit the castle and tour the vehicle displays in the grounds. 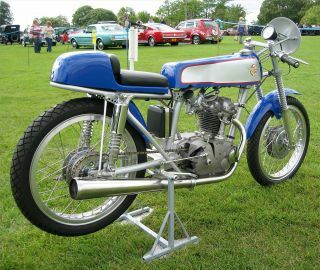 There were celebrative displays marking the centenary of Chevrolet and the half century of the Mini and Jaguar E Type, an automotive auction and an auto-jumble, in addition to the club and individual displays amongst which some notable vehicles could be found, including this classic 1962 Ducati S1 Sport 125cc racer.